Music has always been a part of my life. Growing up, my dad would make Saturday breakfast with Led Zeppelin’s “Houses of the Holy” playing in the background on the turntable. Or we’d take a trip into town with “Back in Black” playing on the in-dash eight-track. These are among my fondest childhood memories. The music was great … and the popovers were delicious! While I’m nostalgic about music in a very personal way, I’m not a “vinylphile” or obsessed with collecting eight-track tapes. I’m all about convenience when it comes to listening to music today. I personally subscribe to Google Play Music, Alphabet’s online music streaming service. I have a family plan so I can share Led Zeppelin, Pearl Jam and my ‘80s favorites with my daughters. I’m amazed at how easy it is to share even obscure tunes that I love with my children. Music streaming has advanced considerably in the past 20 years. Gone are the days of copyright infringement with Napster. Streaming now makes up an irreplaceable percentage of revenue for the music industry. Services like Google Play Music, Apple Music and Amazon’s Prime Music are household names. And the industry providing those streaming services has become extremely competitive. Just last month, the largest internet radio company, iHeartRadio, filed for bankruptcy. Furthermore, shares of struggling Pandora Media Inc. (NYSE: P) have been in a five-year decline, falling from about $40 per share in 2014 to around $5 today. Margins on music streaming are historically thin. As a result, the most successful services, like Apple Music, are subsidized by hardware sales, heavy advertising or a combination of both. So, you can imagine my surprise when Spotify Technology (NYSE: SPOT) went public. The Spotify streaming music service launched in October 2008. 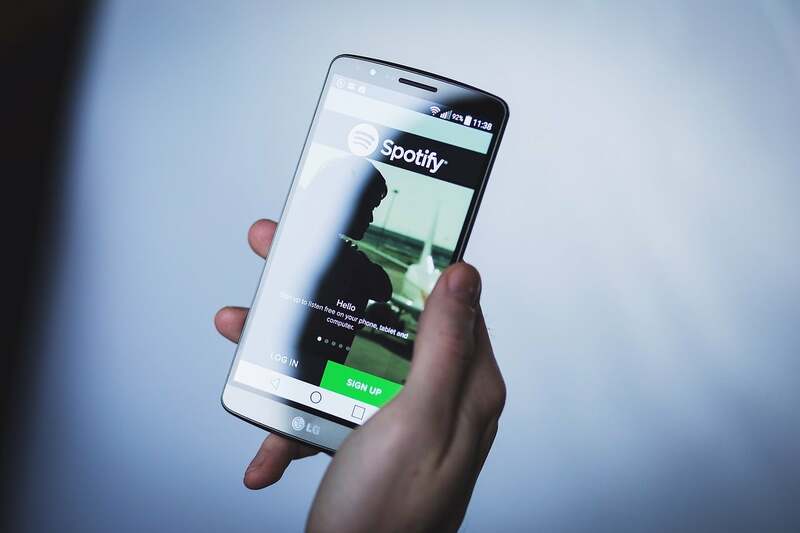 Pioneered by Swedish company Spotify Technology, the service quickly gained favor among music companies for its top-of-the-line data rights management (DRM) practices. DRM is what keeps users from copying and freely distributing streamable or downloaded music. The result was a massive catalogue of music that quickly gained popularity among users. Spotify gets users in the door with its ad-supported free service, but most of its revenue comes from paid subscribers. Those paid users have ad-free access to custom playlists and offline listening. The subscriber numbers are impressive. Spotify touts 157 million users worldwide, including 71 million paid users. Paid subscribers made up the bulk of Spotify’s 2017 revenue, which topped 4 billion euros. Spotify’s success is no fluke. The company’s timing in the music industry hit a sweet spot. With both physical and download sales stagnating, streaming revenue is rising rapidly. 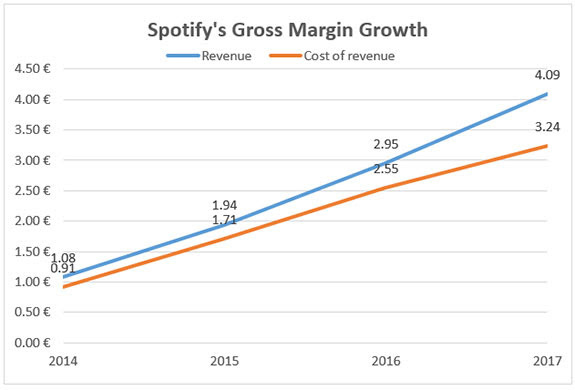 As a result, Spotify’s margins have improved significantly from just 16% in 2014 to about 21% last year. A quick look at these fundamentals would vault Spotify to the top of many investors’ must-have lists. A large and growing subscriber base, consistent revenue growth and improving margins: What’s not to like? Well, for one, going public changes how Spotify reports revenue. Accounting standards for publicly traded firms are a bit different than those for privately held companies, and it could change Spotify’s fundamental outlook. For another, the past does not predicate future results. In short, Spotify must prove itself as a public company. Investors will be anxiously waiting for the company’s first quarterly report as a publicly traded company to see if these trends hold true. But the biggest threat to SPOT stock is how Spotify went about its initial public offering (IPO). In a move that was designed to benefit existing shareholders, Spotify eschewed the established route of bringing in big banks and financial institutions as underwriters. The company opted for a direct listing instead. Such a listing has its benefits. The company has greater freedom to raise capital, with no underwriters’ fees or other costs associated with a traditional IPO. And there’s no lock-up period for SPOT stock since underwriters or pre-IPO investors aren’t holding any shares. The problem with a direct listing is that the shares have to come from existing equity holders in the company. This can create some liquidity issues for SPOT stock, and, more importantly, it wreaks havoc with short sellers who must borrow the shares from potentially unwilling investors. Under a standard IPO, institutions and underwriters hold a significant amount of stock. These institutions are more than happy to rent out SPOT stock for a fee to short sellers. Under a direct listing, SPOT stockholders may not be as keen to lend out their shares to short sellers, creating a serious lack of short interest. In fact, data firm S3 Partners reports that only about 603,000 shares of SPOT are sold short just weeks after the IPO. By comparison, Snap Inc. (NYSE: SNAP) saw short interest of more than 22 million shares following its own public offering. One of the reasons for the lack of short interest may also be that investors aren’t quite sure what to make of Spotify’s fundamentals just yet. In a typical IPO, the underwriter opens up the company’s books and takes them on what is called the “roadshow” for investors to determine whether or not to avoid the company. Spotify had no “roadshow,” making investing in the company highly speculative right now, even for short sellers. When the levee breaks on Spotify’s fundamentals, we will finally see what Wall Street really thinks of the stock. Until then, take care when investing in SPOT stock, and consider using protective puts as insurance if you’re going long the shares. A protective put strategy suggests that you buy a put option for every 100 shares of the underlying stock you own. If you own 500 shares of AAPL, you would buy five put options to protect your investment. If the stock falls in price after the earnings report, the options would gain in value, thus insuring your portfolio against a big loss.